A subtle way to introduce a glimmer of iridescent ornamentation into a room, the mother of pearl mirrors work beautifully as stand alone pieces and melt seamlessly into your home décor. 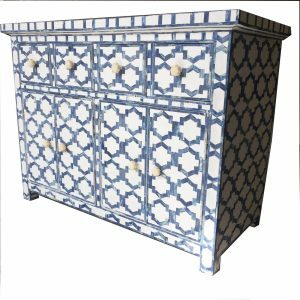 To create an Indian theme in a room, couple an inlay mirror with a mother of pearl chest of drawers, wardrobe or dressing table. 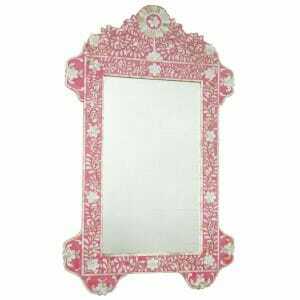 For those considering a larger mother of pearl inlay furniture item, a Rajasthani mirror above a mantlepiece or in a hallway gives you the perfect opportunity to reflect on how well the inlay colour of your choice suits your interior décor. 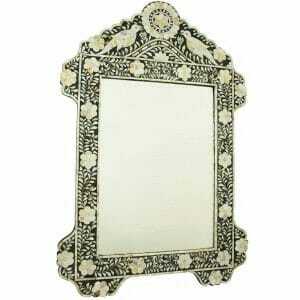 What Are Indian Mother of Pearl Inlay Mirrors? 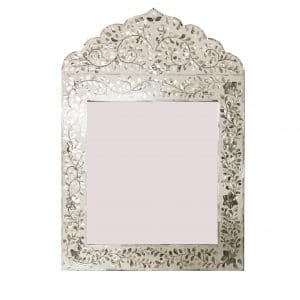 A stunning way to frame your reflection and add a touch of glamour and sophistication to a living room, bedroom or hallway. These mirrors are carved and cut from Indian rosewood and ornamented using the fine detail of nacre patterns in an inlay technique that is as old as the palaces shimmering in the ‘Land of Kings’ where they are made. Solidly hand crafted with substantially thick hardwood and fashioned with sturdy woodworking joints, the frame is built for strength and enduring quality. 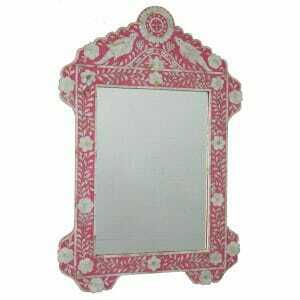 The artisans of Rajasthan, where these mirrors are made, learn their crafts from their forefathers, where this form of Indian art is endemic to the cultural heritage of the region and there are academy schools to train skilled workers and turn them into master craftsmen. The skill required to manufacture one of these mother of pearl inlay mirrors is such that it needs to please the Royal clientèle, who still commission the artisans today. 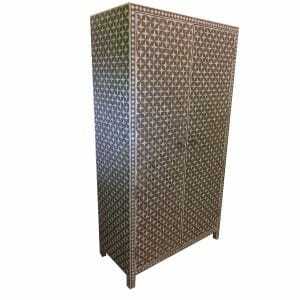 This means the quality of the carpentry is as cultivated as the physical attractiveness of the decorative ornament. 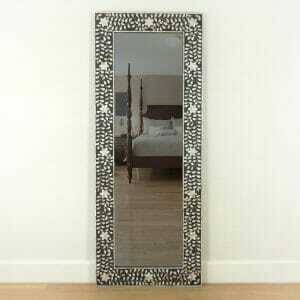 Can I Order a Bespoke Mother of Pearl Inlay Mirror? 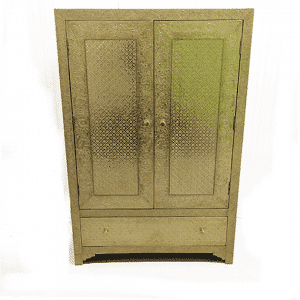 The same artists producing masterpieces of decorative art for Royalty present fresh new designs to us at Iris Furnishings, along with their traditional hallmark pieces and we are delighted to offer a wealth of choice to our customers. 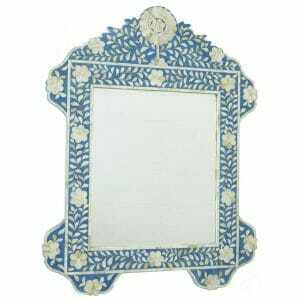 Compare the beauty of the floral patterns to the modernity of geometric shapes and choose between a simple square or oblong frame, or the more ornate scalloped edged or bird headed mirrors making an ornamental feature with their symmetrical artistry. 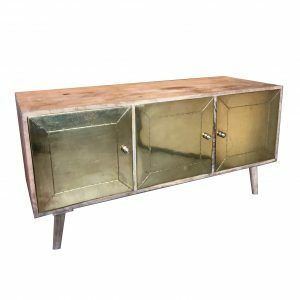 The choice doesn’t end with what you see in our collection and we are happy to offer a no costs bespoke mirror making service, for those special requirements. 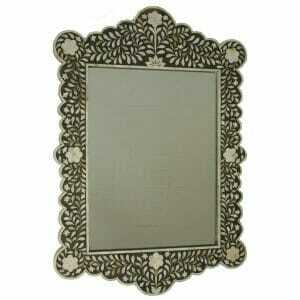 So please do take your time to peruse the different patterns, colours, borders and mirror shapes. 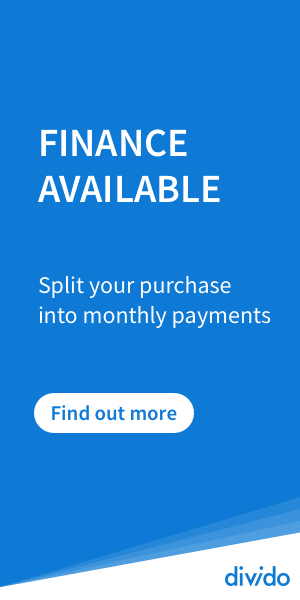 Let us know your preferences, send us the measurements and we can answer you directly with the cost and the estimated wait time. 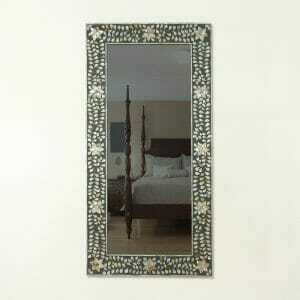 Your inlay mirror will be hand made in Rajasthan and delivered to your door when it has reached our shores. 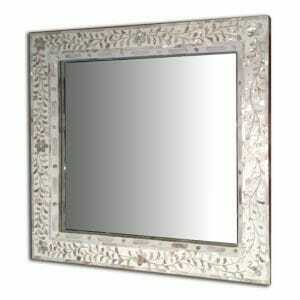 How Can Our Mother of Pearl Mirrors be Fairly Traded as well as Ethically Made? In the long years we have invested in our love of bringing Indian inlay furniture to International shores, we have developed strong connections with the artisan makers and their suppliers, visiting their workshops on a regular basis and assuring ourselves of not only the high quality of all materials, but the ethical resourcing of everything that goes into one of our Indian mother of pearl inlay mirrors and this applies to all our furniture. Everything is made from sustainably harvested sheesham or mango wood that comes often from small plantations and is sold through auction and in accordance with strict policies which adhere to the reforestation laws that support India’s ecological agenda. The trees are replanted and a favourite resource for furniture manufacturing thanks to their amazing qualities, including their ability to last through all kinds of climatic fluctuations and resist all kinds of deterioration. Mango trees that no longer fruit are a favourite wood crop for small farmers and give a tough, enduring wood of high quality and dependable structural integrity. 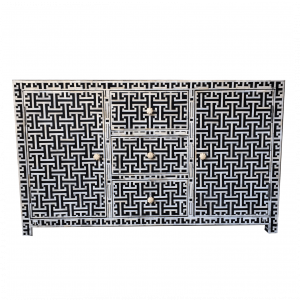 The various handicraft techniques used in the creation of mother of pearl inlay furniture are specific to the local regions of Rajasthan, where locally developed styles in crafts maintain their authenticity as the art is encouraged to flourish in the area. Where Royalty would have been the main patrons for these handicrafts in the past, an international clientele that takes an increasingly appreciative interest in deocrative, ornamented Indian furniture is supporting a thriving local economy and helping to protect the cultural integrity that ensures the craft methodologies and principles remain intact, resulting in finely made authentic Indian furniture of the very highest quality, prospering the communities in which it is made. We dedicate ourselves to maintaining the business practises that honour the artisans, the country and the culture from which the furniture we love so much originates and are glad to be able to sustain these practises, which ensure everyone thrives while these arts continues to flourish. 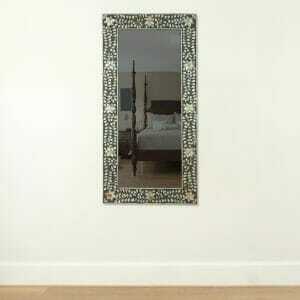 How do I look after Mother of Pearl Inlay Mirrors? 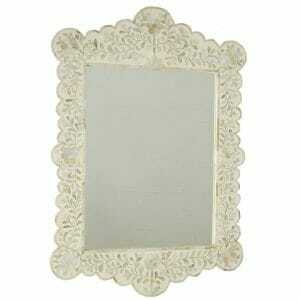 These mirrors require very little care or maintenance. They are not finished with veneers, which tarnish over time and can alter the appearance of the natural materials with which they’re made. It is best to avoid harsh chemicals and if any cleaning care is necessary, use a damp cloth with warm water. 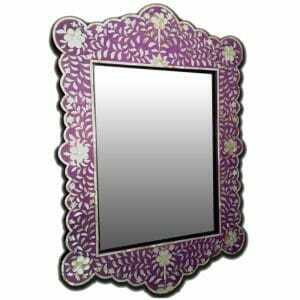 These mirrors are remarkably resilient, made with strength, beauty and longevity at the very heart of the carpentry and artistry techniques developed over the centuries and these principles are faithfully adhered to. 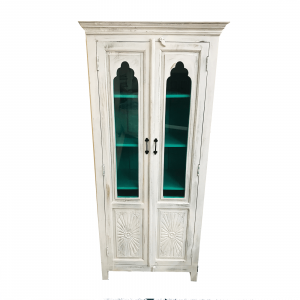 The decorative ornament on the surface is expertly constructed and with care you should have a piece of furniture to last you and your loved ones generations. 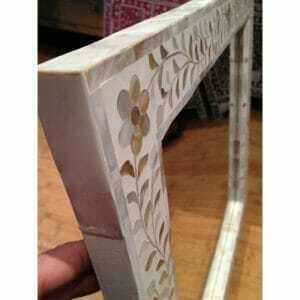 However for those minor accidents, we are able to restore mother of pearl furniture. 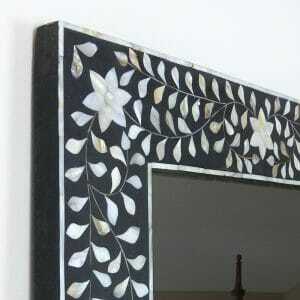 If for any reason you damage your Indian mirror, at Iris Furnishing we apply decades of experience to the restoration and repair of the inlay. In the rare eventuality you should require our restoration services, we can let you know how we can help.